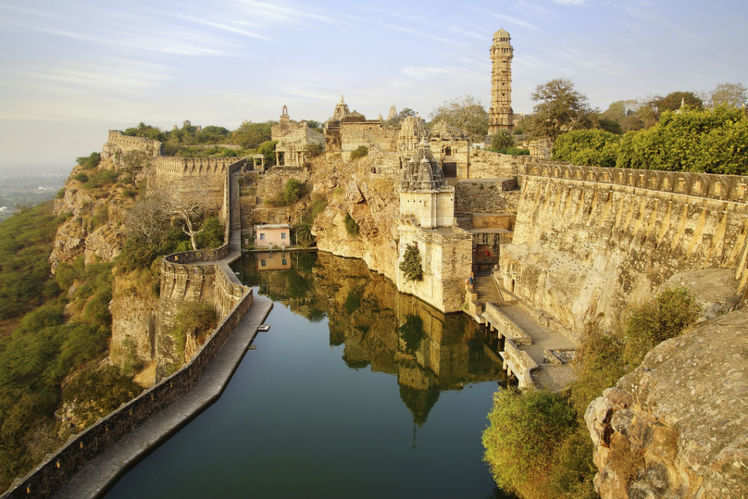 The Fort of Chittorgarh is the largest fort in Rajasthan and the most talked-about fort throughout the history of India. This fort has got one of the best-planned architecture that is best suited for a luxurious lifestyle and also has an advantageous position from the warfare point of view. Once an indomitable fort, this fort eventually fell into the hands of the Mughals who have practically ravaged the entire fort apart. However, the very few architectural remains, that stand even today with their heads held high out of sheer pride and honour, display the grandeur of the Rajput rulers of Mewar. Associated with the heart-wrenching legend of Rani Padmini, this fort has occupied a soft corner in the hearts of every Indian. the Fort of Chittorgarh is a marvel. The fort, when viewed from above, looks roughly like a fish. Spread across an area of 700 acres, the circumference of the fort alone covers an area of 13 kilometers. There are seven massive gates, safeguarding all the entrances. The main gate is called as Ram Gate. The fort has 65 structures including temples, palaces, memorials and water bodies. The fort is open from 10:00 AM to 5:00 PM daily.